The United States was built on immigration. 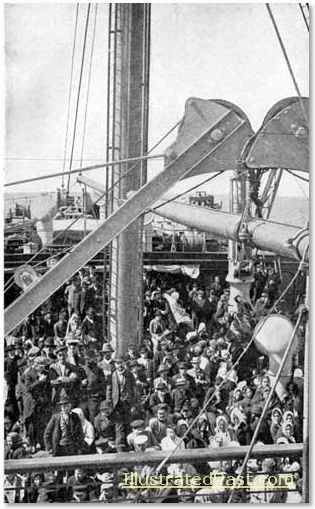 The period of from 1850 to the early 1900s saw a dramatic increase in immigration. In 1820 a total of 8,385 immigrants were admitted into the country. By 1865 over 100,000 immigrants were entering the country each year. 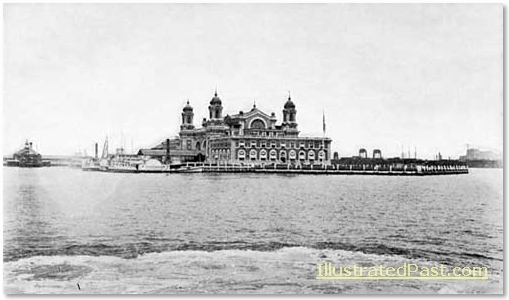 And by 1906 over 1.1 million people were coming to America, most passing through Ellis Island, the immigration nexus. These immigrants were mainly European, but not from Britain. The majority were Italians or East Europeans from Poland, Ukraine and Russia. Among the East Europeans were many Jews and Roman Catholics, whose faiths were often the targets of discrimination and contempt from the established Protestant majority. 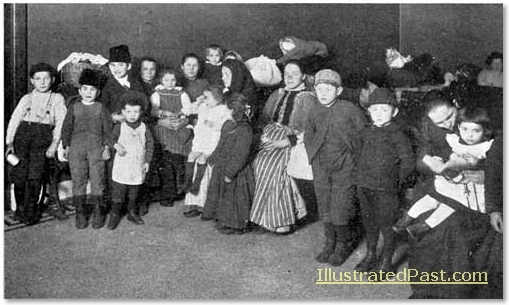 The influx of immigration caused problems of assimilation and accomodation. Many immigrants found themselves relegated to crowded and unsanitary apartments in inner city slums. Still, for many fleeing persecution and dead end poverty in their own country, the living conditions in the worst inner city slums were better than what they had left behind. This is a pictorial history of some of the people that passed through Ellis island during the heyday of immigration. 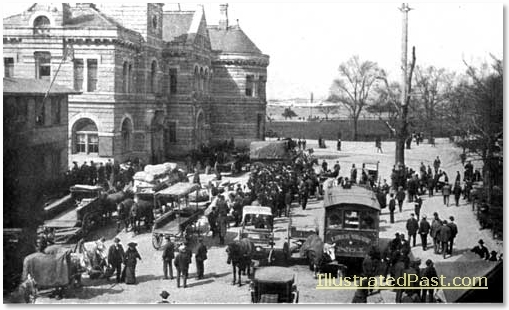 Once the immigrants landed at Ellis Island they had to wait hours and hours in different lines while their applications for entry were processed. There were questions, and more questions, and medical examinations. For the lucky, the process ended with permission to board a ferry to New York. For those rejected, the process led to detention and deportation. 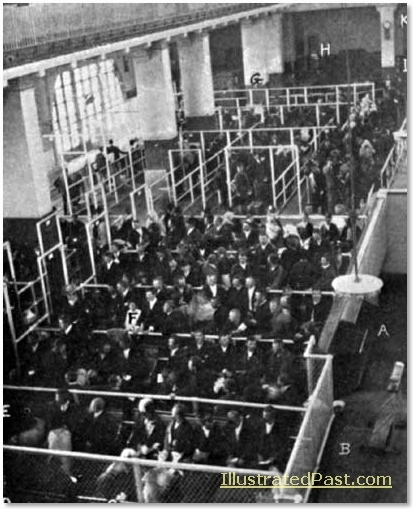 (A) Entrance stairs; (B) Examination of health ticket; (C) Surgeon’s examination; (D) Second surgeon’s examination; (E) Group compartments; (F) Waiting for inspection; (G) Passage to the stairway; (H) Detention room; (I) The Inspectors’ desks; (K) Outward passage to barge, ferry, or detention room. 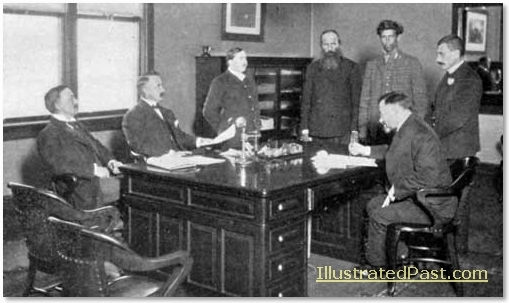 In the picture below, an immigrant rejected for admission appeals to a special tribunal. The lucky ones that made it through the immigration screening were then allowed to take a ferry that landed them in New York. Below is a picture of the newly arrived immigrants landing at Battery Park. The immigrants were now in America, but their struggles were far from over.